A twin pregnancy places additional demands and risks on a mother and her babies compared to a singleton pregnancy. Because of the increased risk for complications and poor outcomes, women with twins are more likely to deliver preterm than carry to term. Early diagnosis of the type of twins and close prenatal monitoring will guide prenatal care and delivery planning. A second ACOG reference (page 364) states that preterm birth is the most common complication of twin or other multiple pregnancies. 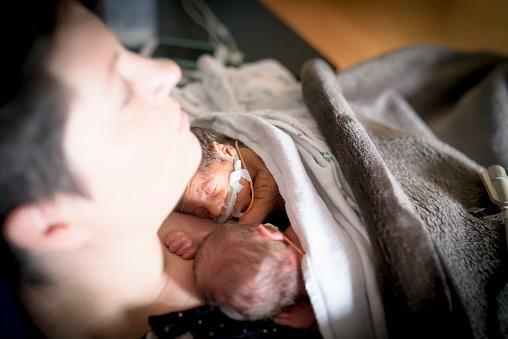 Although preterm delivery of twins causes increased complications of prematurity, delivery after 37 to 38 weeks also increases the risk of fetal and newborn death, according to a 2014 article in Best Practice and Research. This compares to an increased risk after 42 weeks (post term) for singleton pregnancies. Delivery between 32 and 34 weeks: Identical twins who share a single chorionic, a single amniotic sac, and a placenta (monochorionic-monoamniotic); the mother should be hospitalized for monitoring between 24 to 28 weeks. If there are any complicating factors, doctors might recommend delivery before 32 weeks. A variety of maternal and fetal factors can affect the chance of a twin pregnancy making it to term. A previous history of preterm delivery is also a factor in preterm delivery of a twin pregnancy. The following fetal complications of twin pregnancies can be diagnosed by pregnancy ultrasound. They increase the chance of delivering or needing to deliver before reaching term. 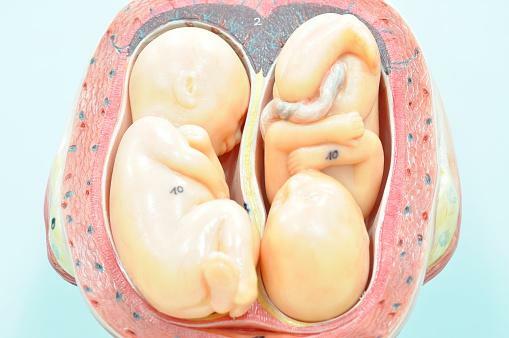 Entangled umbilical cords - the cords of twins in a single chorionic and a single amniotic sac can twist around each other, decreasing the supply of nutrients and oxygen and increasing the risk of death of both twins before, during, or after delivery. Twin-twin transfusion - in twins who share a single chorionic sac and a single placenta, a connection between their blood vessels in the placenta causes one twin to get a blood transfusion from the other. One twin then has too much blood and the other too little and both suffer complications from this. Intrauterine growth restriction (IUGR): There is an increased chance of preterm delivery when there is slow growth of one or both twins compared to normal growth of both, according to a study of twin pregnancies published in 2005 in the American Journal of Obstetrics and Gynecology. Intrauterine death of one twin - when one twin dies early in pregnancy, preterm delivery of the surviving twin might be necessary. Malpresentation - there is an increased chance of breech or other malposition of the fetuses increasing the risks of complications at delivery. 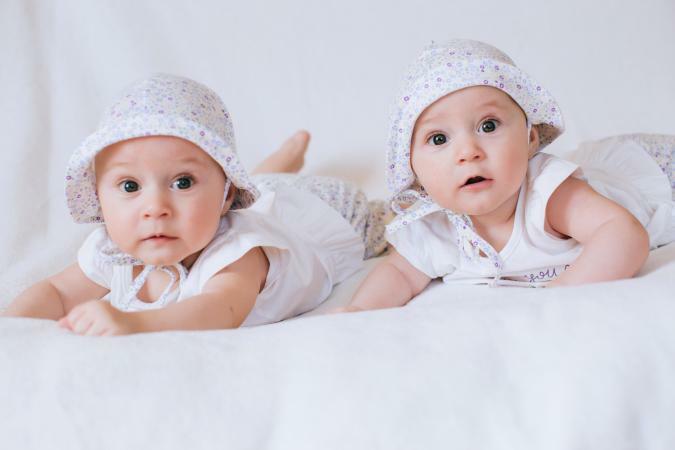 When one twin is born prematurely because of preterm labor or preterm rupture of the membranes, the goal is to try to delay the delivery of the second twin as long as possible. There are no large studies on how long the second twin can survive in the uterus after the birth of the first, but case reports range from a few days to weeks. The longer the second twin can stay undelivered the better the chance of survival. The duration and outcome depend on each person's situation and any complications that develop. After 32 weeks, the risk of complications appears to increase, including infection in the mother or second fetus and stillbirth. Delayed delivery is an option only if the second twin is in a separate amniotic sac from the first, does not share a placenta, and the sac is not ruptured. There is no consensus on the best choices of treatments to delay delivery. In general, the focus is on preventing uterine contractions and infection and keeping the cervix closed to buy as much time as possible for the remaining baby to mature further. Keep all prenatal appointments and get all recommended ultrasounds and fetal monitoring. Expect to have more frequent prenatal visits and ultrasounds than if you were carrying one baby. Eat a healthy pregnancy diet and drink enough water daily. You need to eat 600 extra calories a day and ensure that you take folic acid and iron as prescribed by your doctor. Engage in low impact exercise such as swimming and yoga, rather than jogging or other high impact aerobics. Find an OB specialist who has experience managing twin pregnancies. 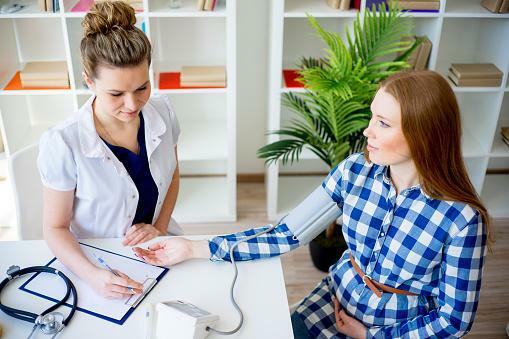 Follow you doctor's recommendations if he advises you to restrict work, travel, exercise or other physical activities, or orders bed rest for the remainder of your pregnancy. Be aware of signs and symptoms of labor. If you go into preterm labor, your doctor might give you steroids to mature your babies' lungs and medicines to try to stop your labor. Routine bed rest has not been shown to improve the outcome if your pregnancy is uncomplicated, according to the most recent analysis of the Cochrane Database published in in 2017. It will likely be recommended if you or your babies have complications. The duration of bed rest, which might be in the hospital, depends on the reason for the recommendation and might last until delivery. Carrying twins comes with special concerns beyond those of a singleton pregnancy. You have greater chance of having a preterm baby than carrying to term. Close monitoring by your OB doctor will keep track of the health and growth of your babies and the best timing of your delivery.